Need a little more closet space? Reduce clutter and stress while maximizing usability with these cool adaptable DIY closet design ideas. LEARN MORE HERE. Whether you live in a tiny studio apartment, a sprawling suburban home, or maybe even Buckingham Castle, you probably could use just a “leeetle” more closet space. Regardless of if you need to store clothing or cleaning products, a well-designed closet minimizes clutter and stress and maximizes usability. You can even take it a step further, and make your closet into your own personal boutique! Of course, like snowflakes, no two closets are the same. There are, however, some cool basic closet design ideas that are worth considering for any closet. Whether you need a place to store necklaces or hoses, ties or twist ties, check out some easy, adaptable methods for storage. We’ll start with the simplest closet organization ideas, then move on to some more complex DIY closet design projects with tutorials. Whether you need to store pot lids, wrapping supplies, or purses, the back of the door is an incredibly useful spot. Attach hooks, bins, hanging rods or shelving and suddenly double your storage possibilities. Learn more here. Like using the back of a door, you can also use the underside of a surface for added storage. Attach inexpensive baskets and gain a whole new perspective (as well as more space!). There’s a video describing how and more details here. This is a brilliant, and brilliantly simple, solution to piles of sweaters or sweaters stretched out on hangers. Buy a basic hanging shoe organizer, then place a sweater in each cubby. You can branch out further and try storing jeans, T-shirts, and, hey, maybe even shoes! Find out how here. Save yourself tons of time and trouble by placing a mirror in your clothing closet. You’ll be able to examine your outfit without taking the clothes very far, which means you’re far more likely to any unwanted items BACK. Find out more here. Just like using a shoe organizer for multiple purposes, you can take advantage of the convenience of a tie rack whether you wear ties or not. It can display long necklaces, scarves, ribbons, tights, belts as well as camisoles or tank tops… try it out! There are more ideas here. 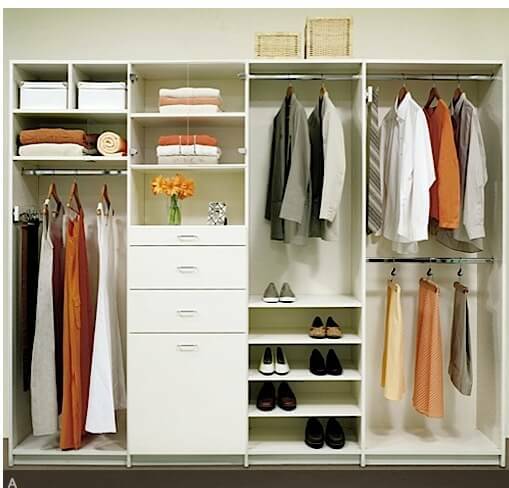 This is a fast way to better organization as well as a much more neat and streamlined-looking closet. Use basic shelf dividers to separate out shirts from sweaters and sweaters from sweatshirts. They’re also great to sort out purses as well. You can buy shelf dividers, or make your own using old wire shelving, cardboard, or even magazine holders. Learn how here. Yes, you can organize your clothing by color, but take it a step further simply by picking the colors you use in the closet wisely. Match your hangers, either by buying in fashion colors or painting white or wire hangers. Use light containers labeled with photographs and beautiful script for basic storage. Then, paint any additional items (tie racks, shelving etc.) in a matching or contrasting color for extra pop. Find out more here. How would you like an extra 20-30 minutes of time each morning? That’s enough time to hit the snooze button a couple more times, or actually have a sit-down breakfast with your family. Earn more time when you need it most by setting out your clothing for the day, or, if you’re feeling extra organized and ambitious, for the week. This is also a great tool to use with kids to cut down on wardrobe meltdowns. Let the little ones participate by selecting their own outfits and putting them together with labeled hangers – they’ll learn some great things about keeping themselves organized while lowering your stress level! Find more here. Side walls, cubbies, corners, even the closet ceiling can be creatively used to maximize storage and keep everything clearly organized. Try hanging your sunglass collection on a side wall, or adding a narrow shelf or container on wheels into dark corners for out-of-season storage. Find out more here. A super-creative variation on that idea is storing luggage (or other large objects and bags) above the inside of your closet door. Install hooks, hang, presto! Learn more here. Let’s move into the slightly more “project-y” DIY projects now. 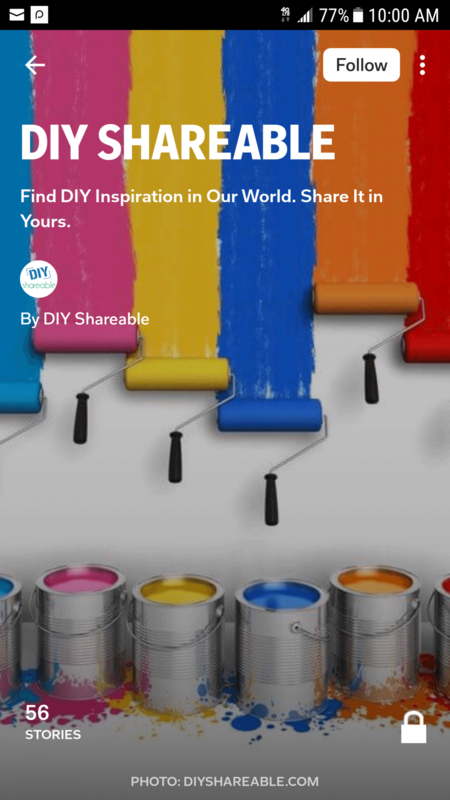 Most are still very accessible to even a novice DIY-er, with a little patience. Nothing leads to clutter faster than shirts sliding off their designated hangers. Use pipe cleaners to create a slip-free surface, and add an eye-catching bit of color to your design. Learn how here. There’s a good variety of ways to do this; two of my favorites (they’re the easiest!) are hooking hangers together with a can tab to stack the hangers, or linking them using a chain. For the can tab concept, pop the top of your favorite can, hang it around the neck of a hanger, then just attach the next hanger to it. More details here. If you choose the linking chain option, it’s as straightforward as hanging a chain on the first clothes hanger hook, then just stacking as many hangers as will fit in your space by hooking them on the chain. Full details here. This idea is both practical and adorable. It takes advantage of space that is frequently wasted, and keeps everything organized. Plus, if you have a great tight collection, what a way to show it off! You can also use this for light leggings, scarves, ties, or camisoles. Use wooden clothespegs, draw a line where you want them to be, then pick up that handy glue gun. Easy! Full details here. You can buy these (often at exorbitant prices) or make your own. The latter option allows you to tailor it exactly to your unique needs and space. All you will need is some particleboard – or wood! – measuring and cutting tools, and a few brackets. Find out more here. If you have a box of treasures – necklaces, bracelets, rings etc. – think outside the box to create a beautiful exhibit in your closet while at the same time keeping every piece fresh in your mind, ready to wear.There are a wealth of possibilities (Pun! Sorry!) you can employ; these are just two of the easier ones. Use a towelrack/bar, S-rings, toilet paper holders and baskets as shown above to create a custom jewelry wardrobe within your closet. Find out more here. Or, keep it even simpler and cheaper by using paint sticks. Try painting them a bright complementary color, or just stain them to keep the look more classic. Details at Infarrantly Creative. It’s possibly my personal favorite in this list, simply because it’s so unexpected. Here’s the scoop: Buy a cheap (super, super cheap – usually $2-3) plastic Rain Gutter Guard. Measure and pick the size you want, or cut to size. While you’re at it, feel free to paint it a fun color or metallic for extra flash. Hang it on a wall using sticky-tape based hooks. Cover in earrings. That’s it – fun, pretty, and it keeps everything easy to find. Learn how here. In a similar vein, try using a pegwood board with hooks to hang purses, scarves, necklaces or other accessories. Full details here. If you have more pairs of pants than hangers or closet space, there’s a solution. You can either buy a sliding pants rack, or with a little ingenuity (and for a lot less money), make your own. Storing your pants like this means fewer creases and more space: Win-Win! If you decide to build, just pick up some wood, a wooden dowel, and drawer sliders from your local hardware store. The only equipment you’ll need are a drill, miter saw, hammer and tape measure. Find a full tutorial at Instructables. Another super-adaptable basic idea, using inexpensive products. You might even have an old shower curtain to recycle! Take it a step further by hanging your new organizing tool on a bit of unpopular real estate, like the back of a door, or an unused bit of corner. Find out more here. Take a tension rod, add a few wire hangers that you customize yourself, and voila! A unique, space-saving shoe storage idea, especially for flip-flops, sandals, ballet flats, or other casual shoes. Mount the curtain rod on a few brackets, or use a wooden dowel or bit of PVC pipe, first. Then take your flimsiest, cheapest metal hangers, and use a pair of pliers to split and curl! If you’re feeling fancy, add a stylish bit of ribbon or cloth to make a “jacket” for the top of the hanger. Full tutorial here. If your shoe collection veers less sandal and more boots, you need a system that both saves space and keeps the boot in good condition. Crumpled tall boots take up a ton of room, and look terrible, but simply using boot-shapers only solves half the problem. You can buy specialty boot hangers, but the more cost-effective and customizable approach is (naturally) to Do It Yourself. Here’s the easy fix: Use clips and nails to hang boots directly from the wall. Add a bit of soft fabric between the boot and the clip to protect leather or suede. Find out how here. A great project for many different purposes: making closets where there are none; repurposing a room into a bedroom; dealing with a studio apartment with limited closet space; or even just recycling an old entertainment system. Clean the chosen piece of furniture thoroughly, sand, prime and paint then make it exactly what you need! All the details are here. If you’re looking for something more mobile that can double as a room divider, try a freestanding pegboard closet. This takes a little more time and a few more tools, but is incredibly flexible. Use it to store pots and pans in the kitchen, make a hanging garden in the living room, or organize your clothes by hanging the next day’s outfit where it’s easy to find. Full tutorial here. This is a more complicated project, no question. It requires familiarity with basic carpentry, and a willingness to create some nifty moving arms using brackets. However, it’s a fantastic way to make use of all the space you have in your closet, and remember, tie racks can actually hold practically anything. If you have a collection that you’d like stored flush, that can be opened out for inspection, try adapting this tutorial. Full details here. Like most DIY projects, any of these ideas can be expanded upon and adapted to fit your exact needs. Get creative! Look around at a few fancy container or closet stores, then look around your house. Ten-to-one you have a pile of things that could be used to create the same results for a tenth of the price. Then, let us know! Take before and after pictures of your closet design and share them – it’s the best way for us all to learn from each other. Looking forward to being inspired by you!